경주시 북쪽 소금강산의 백률사에 있던 것을 1930년에 국립경주박물관으로 옮겨 놓은 것이며, 전체 높이 1.77m의 서 있는 불상으로 모든 중생의 질병을 고쳐준다는 약사불을 형상화한 것이다. 머리는 신체에 비해 크지 않은 편이며, 둥근 얼굴·긴 눈썹·가는 눈·오똑한 코·작은 입 등에서는 우아한 인상을 풍기고 있지만, 8세기 중엽의 이상적인 부처의 얼굴에 비해 긴장과 탄력이 줄어든 모습이다. 커다란 체구에 비해 어깨는 약간 빈약하게 처리된 느낌이지만 어깨의 굴곡은 신체에 밀착된 옷을 통해 잘 드러나고 있다. 양 어깨를 감싸고 입은 옷은 두 팔에 걸쳐 흘러내리고 있으며 앞가슴에는 치마의 매듭이 보인다. 앞면에는 U자형의 주름을 연속적인 선으로 그리고 있는데 조금은 도식적으로 표현되어 있다. 신체는 아래로 내려갈수록 중후해지며 옷자락들도 무거워 보이는데, 이것은 상체를 뒤로 젖힘으로 인해 자연스럽게 솟아오른 단전과 더불어 불상의 특징을 잘 보여주고 있다. 두 손은 없어졌으나 손목의 위치와 방향으로 보아 오른손은 위로 들어 손바닥을 보이고, 왼손에는 약그릇이나 구슬을 들고 있었던 것으로 보인다. 다소 평면적인 느낌을 주지만 신체의 적절한 비례와 조형기법이 우수하여 경주 불국사 금동비로자나불좌상(국보 제26호), 경주 불국사 금동아미타여래좌상(국보 제27호)과 함께 통일신라시대의 3대 금동불상으로 불린다. 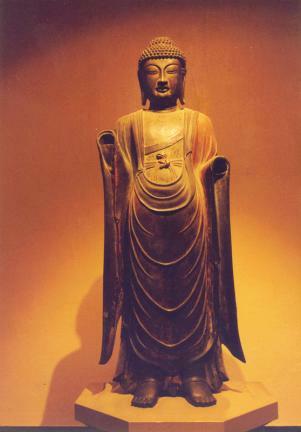 Originally located at Baengnyulsa Temple on Soguemgangsan Mountain, north of Gyeongju, this Buddha statue was moved to Gyeongju National Museum in 1930. 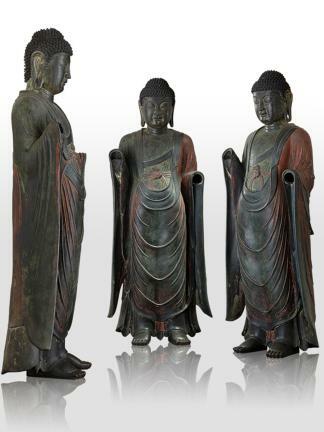 Standing 1.77 m tall, this statue represents Bhaisajyaguru Buddha, or the Buddha of Medicine, who is believed to heal people’s suffering. The round face is relatively small for its body, but it gives an elegant impression with its long eyelashes, long slanted eyes, sharp nose, and small mouth. It lacks the elasticity of ideal Buddhist statues produced in the mid-8th century. Although the body is huge, the shoulders look rather slight. The robe, draped tightly around the shoulders and body, clearly reveals the shape of the shoulders. There are the U-shaped folds in the front of the robe, and the skirt is tied at the waist. The dignity in the lower half of the body, the heavy skirt along with the belly swollen and the bust bent backward show the characteristics of this statue well. The two hands have been hewn off, but, judging from the position of the wrists, the right hand must have been raised to show the palm and the left hand to hold a medicine jar or beads. This statue looks somewhat simple, but it shows the well-proportioned expression of the body and attests to the excellence of the molding technique. 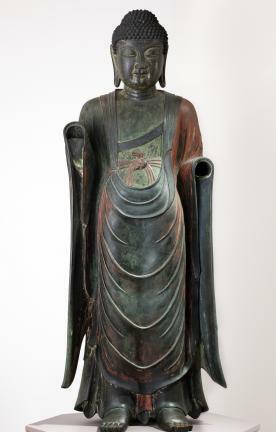 This statue is regarded as one of the three greatest gilt-bronze Buddhist statues produced during the Unified Silla Period, along with the Gilt-bronze Seated Vairocana Buddha of Bulguksa Temple (National Treasure No. 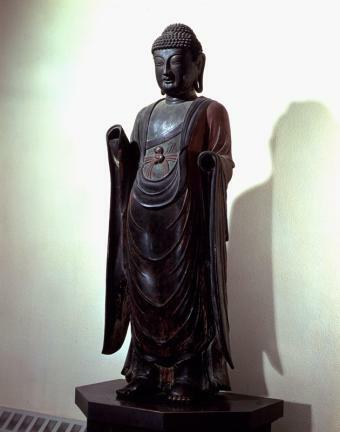 26) and the Gilt-bronze Seated Amitabha Buddha of Bulguksa Temple (National Treasure No. 27).